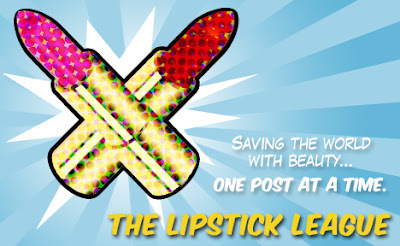 For the month of December, we’re super-sizing The Lipstick League and giving you double the fun from each member! Question of the Week: What’s your go-to body lotion for this time of year? we heart this - just turned four, but is giving YOU a present: a European holy grail giveaway - Lancome Erika F. eye shadow and Max Factor Fantasy Fire nail polish! we heart this - What trumps RiRi Woo? Pleasure Bomb! Check out the RiRi hearts MAC Holiday collection and see if you agree. Beauty Junkies Unite - Here's a chance to win all 20 shades inside the new bareMinerals 'Degrees of Dazzling' eyeshadow collection! Beauty Junkies Unite - Amber shares several holiday gift ideas for the ultimate in affordable luxury. Chalkboard Nails - Enter to win the Cirque Alchemy Collection and lots more in Chalkboard Nails’ 12 Days of Giveaways! Chalkboard Nails - Have you tried any Formula X for Sephora nail polishes yet? Don’t miss this gorgeous cobalt blue glitter gradient! Clumps of Mascara - I’m not a girl with a lot of desires. Or so I thought. My holiday wishlist has now doubled in size. Eek! Clumps of Mascara - Girls, listen...my skin has been screaming for something more than just a basic scrub. M.Steves has saved the day with their glorious Reviving Exfoliator! EauMG - has the ultimate holiday gift guide for vintage beauties! Stock the boudoir with red lipstick, powder puffs and fancy perfume atomizers! A must read for true glamour girls. EauMG - step foot into a Parisian artist’s studio with this decadent, boozy, fruity patchouli perfume, Nez a Nez Atelier d’Artiste. Gouldylox Reviews - Can a brush that looks like a toothbrush give you the makeup skills of a pro? Find out! Gouldylox Reviews - The hair authority on DIY braids, buns and twists, Hair Romance, has a new book that you're going to need. My Beauty Bunny - Just what is the deal with parabens and why is everyone so afraid of them? The answer may surprise you! Are the Parabens in Our Beauty Products Safe? My Beauty Bunny - Check out Jen's new do by West Hollywood celeb hair stylist Marco Pelusi! Purchase his amazing hair care products during his Holiday Deal and receive a FREE travel sized Color Hydrate Conditioner. Nouveau Cheap - Wet n Wild has a brand new 8-pan eyeshadow palette for 2014. Come take a look at some swatches! Nouveau Cheap - The semi-annual CVS Beauty Clearance Sale is now underway. I’ve got a list of things you can expect to see reduced to 50-75% off. Stocking stuffers, anyone? Prime Beauty - has put together her list of Top 10 Beauty Stocking Stuffers. Some may surprise you! Prime Beauty - has several fantastic favorite sets from the tarte Gift of Giving Holiday 2013 Collection and you can win two of them so hurry and enter! Phyrra - shares her Best Ways to Apply Loose Eyeshadow! Phyrra - shares 6 Eye Makeup Mistakes You Don't Want to Make. Guest Post of the Week, as chosen by we heart this - Sabrina from The Beauty Look Book shares the new Chanel nail colours and does what she always does so well; makes us want expensive things!